Home » Article » Richard Croft: Rinse and Repeat? Richard Croft: Rinse and Repeat? The Tomb Raider community was recently treated to some news hot off the press. So begins another exciting entry in the Richard Croft: Super Dad saga. Yes. Seriously. This is happening again. 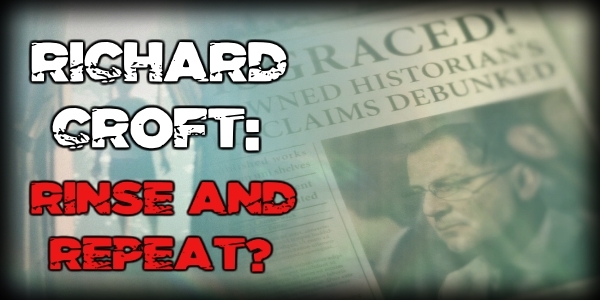 A new piece of official Tomb Raider media is being published and, yet again, it’s based around the life and death of Richard Croft. It’s not like we’ve already been subject to this story repeatedly or anything; for example, in the 2001 blockbuster Lara Croft: Tomb Raider starring Angelina Jolie. Or again in the Legend-Anniversary-Underworld (LAU) trilogy. Then again in the 2013-onwards rebooted ‘Ascension’ trilogy. (I coined the name while talking to fans, and the name stuck). 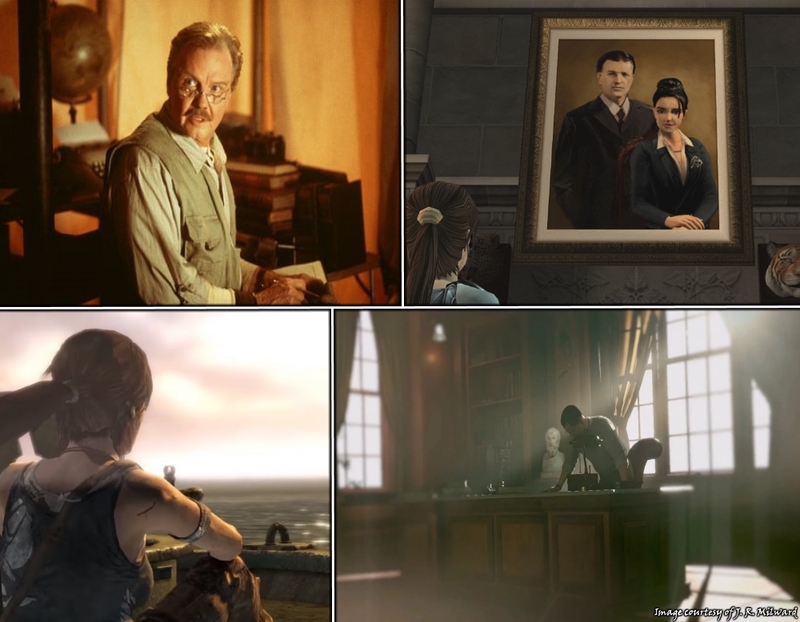 Clockwise from top: Lara Croft: Tomb Raider (2001), Tomb Raider: Legend (2006), Rise of the Tomb Raider (2015), and Tomb Raider (2013). Images courtesy of J. R. Milward and IMBD.com. If you weren’t already sick to the back teeth of Mummy and Daddy Croft, never fear: the plot of the upcoming 2018 reboot movie starring Alicia Vikander also deals with Lara hunting for the truth about her father. And fans have now been informed that the new comic book series will, once again, revolve around Lara delving into the mysterious circumstances of Richard Croft’s demise. We’ve literally had sixteen years of the same story being told, retold, and then told again. I’m actually starting to question why Lara Croft is still the protagonist of Tomb Raider. If Richard Croft is apparently such an exciting and intriguing person, then why haven’t we had an entire game where he’s the main playable character? That wasn’t a suggestion by the way. Hold your horses. Everyone knows that wouldn’t sell. And why? 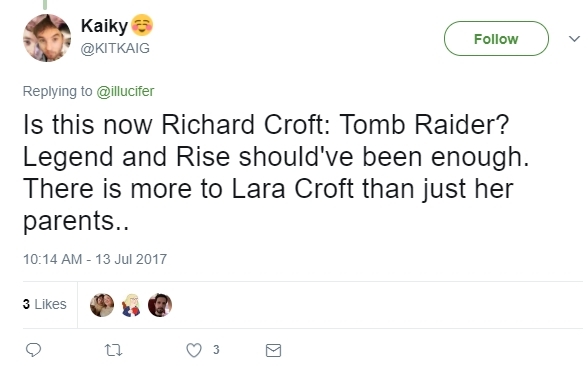 Because everyone also knows that Lara Croft is the protagonist of this series. Lara Croft, the tombs, the temples, the ancient mysteries and magical artefacts she hunts down – these are the ingredients that makes the franchise tick. 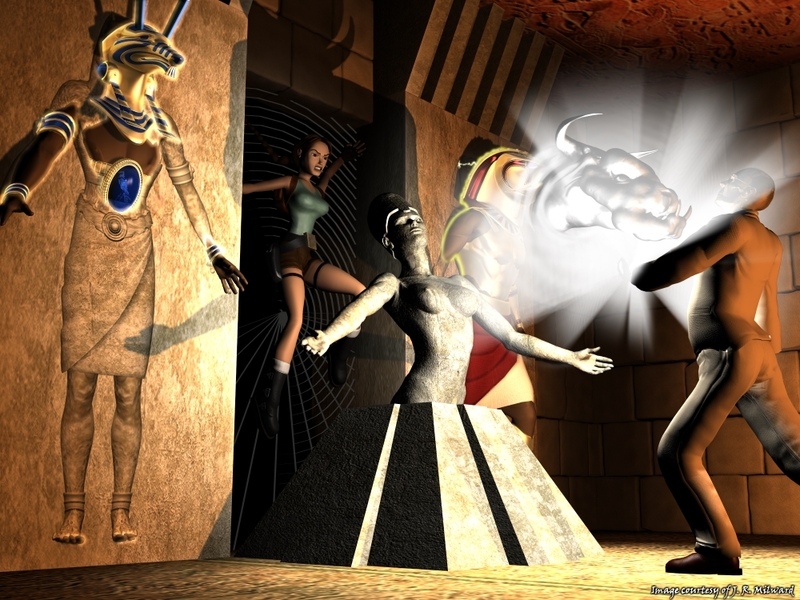 Gods, monsters, fortune and glory… Whatever happened to *actual* Tomb Raiding for the sheer joy of it? 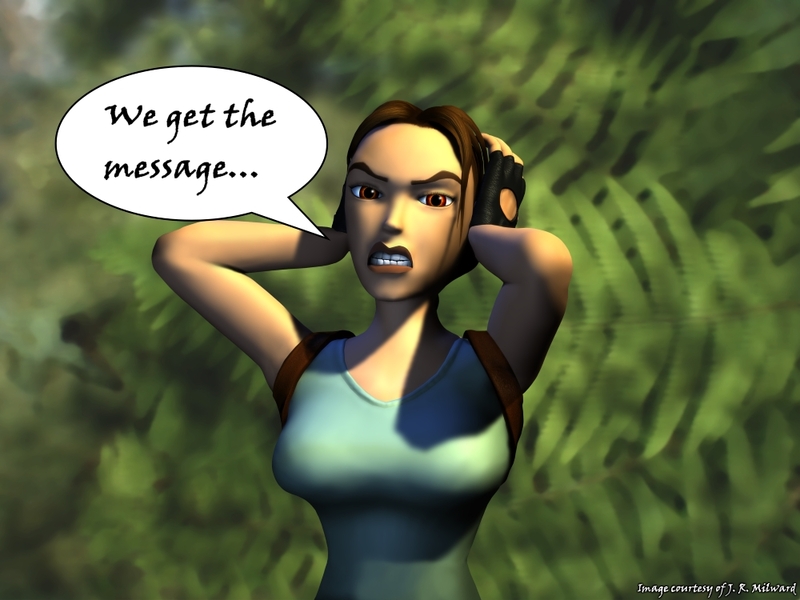 The purpose of Lara’s parents (whether Amelia or Richard), has been the medium to introduce Lara to ancient stories. Their role in the games has been, effectively, an elaborate way of telling their child a bedside story and introducing her to ancient myths. However, instead of sitting at the foot of Lara’s bed and reading to her, they’ve vanished into thin air, or killed themselves, or died mysteriously with links to a legend – forcing Lara to pursue their stories and learn their truth. Lara’s parents became the dramatic conduits dragging her into the action. Fair enough; from a story-telling point of view, Lara has to be willing to go to these crazily dangerous places and fight for a good reason, right? My issue is that it’s always her parents who are the driving force behind this. The LAU and the current ‘Ascension’ incarnations of Lara Croft rely so heavily on the story of her parents that her character has all but lost her own self-motivated, determined, independent, and selfish-curious nature. 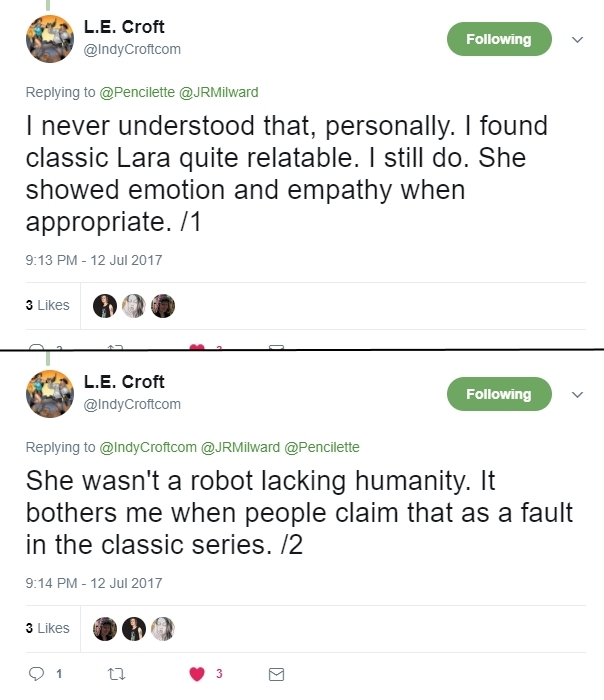 Having a close and loving relationship with her parents has softened Lara’s character significantly. She’s no longer the outcast she used to be – quite the opposite; she yearns more than ever to have her parents alive and well. For that, I don’t blame her at all; who wouldn’t want this? Lara’s character in LAU, the movies, and the Ascension trilogy has much more pathos than ever before, largely due to her status as an orphan and her obsession to discover the truth of what happened to her parents. Why is this a bad thing? Because it’s a formula that has been done to death before – not only three times in Tomb Raider (with another two versions of the story still to come), but in wider pop-culture, and that makes it seem unavoidably lazy on behalf of the writing. Lara Croft has merely joined the ranks of other fictional orphans. She’s Superman. She’s Bruce Wayne. She’s Harry Potter. Her story is no longer an original story, and her character is no longer an original character. 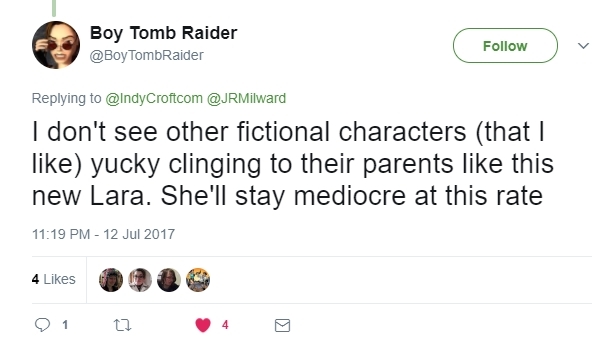 Fans have been sick of the story of Lara’s parents for years. You need only enter one of the many forums dedicated to Tomb Raider – or bring up the subject on social media – to see how hostile and jaded most of the fanbase feels about the role of Lara’s family. 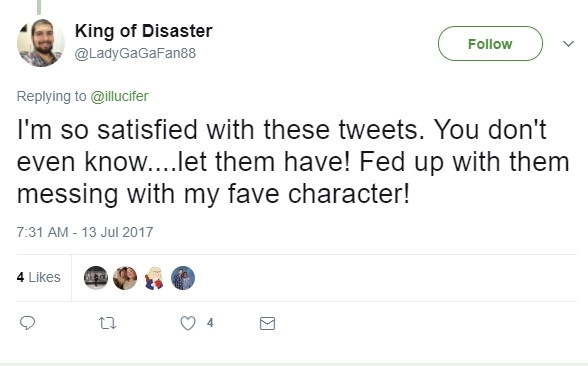 A small sample of fans reacting to the news about Dark Horse’s new comic series. I have no problem with Lara finding out about ancient myths via other people. 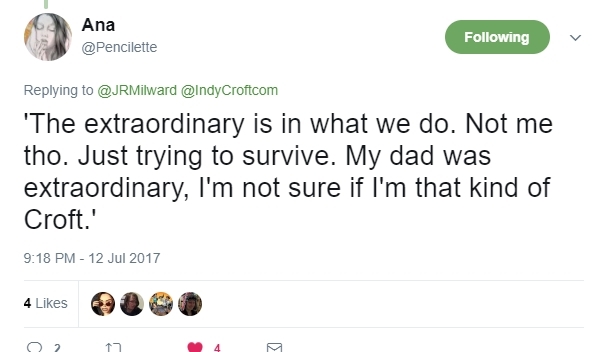 My issue is the ‘personal connection’ to Lara’s family that flows through every story the current team write for the games, films, and comics. It’s so detrimental to the empowerment of Lara’s character – not only as an ‘archaeologist’, but also as a woman – to be constantly following in her father’s footsteps. The writers injected this motif right into the heart of the original 1996 Tomb Raider story when they tackled Anniversary in 2007 and said that Natla already knew Lara’s father. What would happen if they repeated this pattern for the other games? 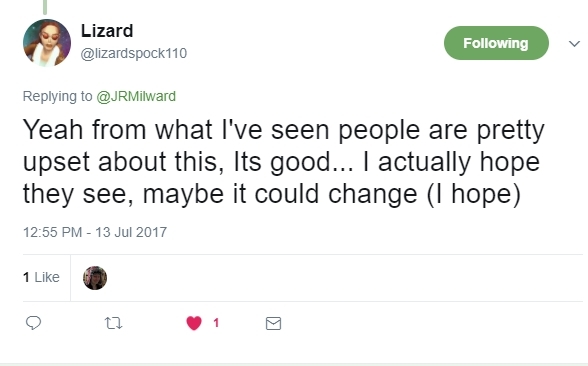 Would Marco Bartoli have commissioned Richard to find the Dagger of Xian? Was Dr. Willard an old friend of Amelia? Was Richard Croft actually Semerkhet in a previous life? Did Richard try and seek out the Philosopher’s Stone to stop his wife from dying? Did he want to secure the Spear of Destiny and hide it from Trinity? My point is: look how changing the motivational aspect of Lara’s quests would have also fundamentally changed Lara Croft as a character. For all of these stories, Lara became involved either because she was intrigued, greedy, or because she messed up and needed to fix her own mistakes. She was wilfully hunting for artefacts or knowledge because she wanted to, for gain and glory, not because of some tug-on-the-heartstrings tragedy in her family’s past. How many more times can this story realistically be told? Will Lara continue to follow the notes of her parents, always in the shadow of Richard – in other words, will she simply remain the daughter of a ‘disgraced legacy’ – or will she actually shun the shackles of her family’s past, and rise above it to become the self-motivated raider she used to be? Will there come a point when the creative team realises it’s doing the same thing over and over, and actually say “enough is enough”? I sincerely hope that this is the end of Tomb Raider’s parental issues with the upcoming 2018 film and new Dark Horse comic series – that at the end of the ‘Ascension’ trilogy Lara can finally move on from her past, and so can the developers. (And so, quite frankly, can the fans). 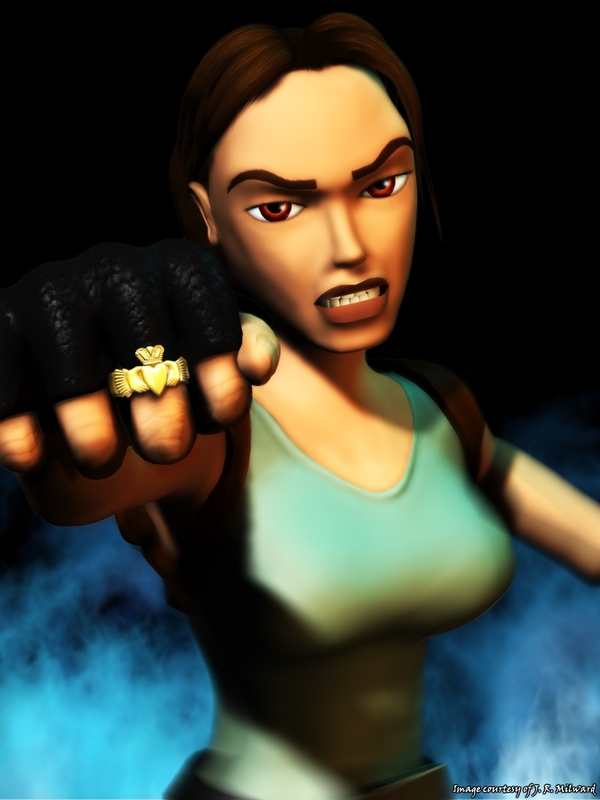 Lara Croft: Tomb Raider on IMBD. Article co-written by Chris Jones and J. R. Milward. Richard Croft: Rinse and Repeat? by Chris Jones, J. R. Milward and Survivor Reborn is licensed under a Creative Commons Attribution-NonCommercial-NoDerivatives 4.0 International License. Based on a work at https://survivorreborn.wordpress.com/2017/07/14/richard-croft-rinse-and-repeat/. 1 Comment on Richard Croft: Rinse and Repeat? I hate the current games owned by square enix. They look way too japanified. Gimme the original english vibes.